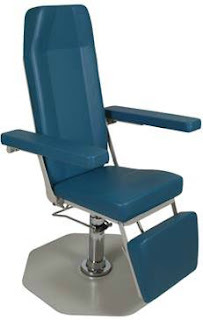 What are the advantages in molded plastic or upholstered blood drawing chairs?Both molded plastic and upholstered styles are good options for phlebotomy chairs for a busy facility. Molded plastic chairs tend to be easily to clean and slightly longer lasting since they do not have the softer surface area that can be cut, scratched or scuffed with wear. 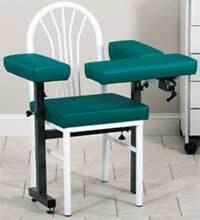 However, the upholstered models are more comfortable, an important consideration for patients. Both types of construction are designed to resist any type of contamination, mold and mildew. Seamless designed prohibit liquids from entering into the chair fabric even on the upholstered options. Surfaces can be sprayed with disinfectant and wiped down between each patient. 2. What is the correct positioning of blood drawing chairs in the laboratory or phlebotomy room?Patients that are in the laboratory or phlebotomy room need to have personal space as do the staff working with the patients. Depending on the style of equipment that you have the blood drawing chairs should be placed with enough room for staff to walk between the chairs and work on either side of the patient to draw blood. This typically means at least four feet between stations to avoid staff bumping into each other. In addition patients tend to feel more comfortable and relaxed if they do not feel crowded or cramped into an area. 3. Is there a cost benefit to electric blood drawing chairs?